H2O2 induced oxidative stress significantly altered (P < 0.05) MDA and GSH level, SOD and CAT activity, and up regulated HSP70 and HSP90 expression in carp hepatocytes. Signaling proteins exhibited differential modulation as revealed from their expression patterns in H2O2-exposed fish hepatocytes, in comparison with control hepatocytes. Melatonin treatment of H2O2-stressed fish hepatocytes restored basal cellular oxidative status in a dose dependent manner. Melatonin was observed to be inducer of signaling process by modulation of signaling molecules and melatonin receptor. Isolated hepatocytes were equally divided (minimum 106 cells/well) into eight groups for undergoing following separate treatments: (a) control [Treatment group 1], (b) H2O2 (12.5 µM) [Treatment group 2], (c) H2O2 (25 µM) [Treatment group 3], (d) H2O2 (50 µM) [Treatment group 4], (e) H2O2 (50 µM) + melatonin (25 μg/ml) [Treatment group 5], (f) H2O2 (50 µM) + melatonin (50 μg/ml) [Treatment group 6], (g) H2O2 (50 µM) + melatonin (100 μg/ml) [Treatment group 7] and (h) melatonin (100 μg/ml) [Treatment group 8]. All the data were expressed as mean ± SE and analyzed by univariate multiway ANOVA, where Pr > F (at 5% significance level) values indicated significance. The population means were compared by a post hoc multiple comparison testing, taking P value < 0.05 as the threshold. Values of melatonin receptor in isolated hepatocytes were plotted against each of the signaling molecules [Akt, Erk 1/2 and NFkB (cytosolic and nuclear)] for linear regression analysis. R2 value of each of the analysis was calculated to understand the correlation. Malondialdehyde level (MDA) was noted to increase significantly (P < 0.05) in all H2O2-challenged groups (Treatment groups 2–4) in a dose dependent manner compared to that in control (Treatment group 1). Level of non-enzyme antioxidant GSH showed a significant (P < 0.05) increase after H2O2 treatment at the concentration of 12.5 µM (Treatment group 2) compared to that in control hepatocytes (Treatment group 1), but it decreased significantly (P < 0.05) after H2O2 treatment at 25 µM and 50 µM concentrations (Treatment groups 3, 4) (Fig. 1a). Level of the antioxidant enzyme CAT increased significantly (P < 0.05) in treatment group 2 compared to that in treatment group 1. However, it showed a significant decrease (P < 0.05) following H2O2 treatment at higher concentrations (Treatment groups 3, 4). Activity of the other antioxidant enzyme, SOD showed a significant (P < 0.05) increase in treatment groups 2 and 3, followed by a sharp decrease in treatment group 4 (Fig. 1b). Melatonin treatment on the highest dose of H2O2-challenged group (50 µM) significantly (P < 0.05) reduced the MDA level, and increased the GSH level close to those in control hepatocytes (Fig. 1a). Activity of SOD and CAT was significantly (P < 0.05) elevated to the basal level in treatment groups 6 and 7 (Fig. 1b). Treatment with only melatonin (Treatment group 8) exhibited no significant difference (P > 0.05) in MDA, GSH and CAT levels compared to those in control hepatocytes (Treatment group 1) (Fig. 1). H2O2 treatment increased both HSP70 and HSP90 expression level in a dose dependent manner. Treatment group 4 showed the highest HSP70 and HSP90 expression level and those were significantly higher (P < 0.05) compared to treatment groups 1, 2 and 3 (Fig. 2a). Both HSP70 and HSP90 expression level was observed to decrease gradually with the increasing concentrations of melatonin treatment, and treatment group 7 showed significantly lower (P < 0.05) HSP70 and HSP90 expression level compared to those in treatment group 4. Treatment with only melatonin (Treatment group 8) exhibited no significant difference in HSP70 and HSP90 expression level compared to those in control (Treatment group 1) (Fig. 2a). Melatonin at 100 µg/ml concentration was found to exert the highest hydroxyl and superoxide scavenging activity (Fig. 2b). Expression level of Akt and Erk1/2 in hepatocytes of Labeo rohita increased with increase in concentrations of H2O2 treatment, and treatment group 4 showed significantly higher (P < 0.05) expression level of Akt and Erk1/2 compared to treatment group 1. Akt and Erk1/2 protein expression level continued to increase significantly (P < 0.05) in treatment groups 5 and 6, but reduced again in treatment group 7. No significant alteration was observed in Akt protein expression following administration of only melatonin than that in control hepatocytes (Fig. 3). Treatment group 1 showed the highest expression level for cytosolic NFkB protein, and it decreased gradually from treatment group 2 to treatment group 7 (Fig. 3). On the other hand, significant increase (P < 0.05) of NFkB protein in the nuclear fragment was noted following H2O2- and melatonin-treated hepatocytes in a dose-dependent manner. Melatonin receptor protein (MTR) expression was observed to increase significantly (P < 0.05) in a dose dependent manner after melatonin treatment than all other groups and treatment group 7 showed the highest MTR expression level. MTR expression level significantly increased (P < 0.05) when treated with only melatonin than that in the control group (Fig. 3). Correlating the values of MTR with NFkB (cytosolic and nuclear fractions), MAPK and Erk through linear regression analysis (Fig. 4), it was observed that MTR expression in the hepatocytes is comparatively more correlated with the level of cytosolic and nuclear NFkB (R2= 0.294 and 0.237, respectively) rather than with Erk (R2= 0.092) or Akt (R2= 0.017). High MDA level denoted an elevated oxidative stress  as noted in H2O2-treated fish hepatocytes here. A significant reduction in the level of MDA and the modulation of enzymatic (SOD, CAT) as well as non-enzymatic (GSH) antioxidants after melatonin treatment of H2O2-stressed fish hepatocytes (Fig. 1) collectively demonstrated antioxidative actions of melatonin in hepatocytes of the concerned fish. SOD catalyzes the dismutation of O 2·− to O2 and H2O2, and represents the first line of enzymatic defense against ROS. Thus, in the present study, with increased stress level at the beginning, SOD increased till 25 µM dose of H2O2. CAT catalyzes the decomposition of H2O2 to produce water and molecular oxygen; it also plays a major role in protecting cells against further oxidative damage. In the current study the application of 25 µm dose of exogenous H2O2 cumulatively crosses the tolerable limit of cellular H2O2 which immediately suppressed the normal CAT activity. Therefore, CAT activity gets hampered during the initial phase of H2O2 treatment prior to SOD. In contrast, SOD decreases at the later stage of H2O2 treatment, when highest dose of H2O2 accumulates excess ROS and free radicals and damages the hepatocytes further. Similar response of SOD-CAT system was noted in an earlier work of  in the mammalian hepatocytes. Present study by showing a significant alteration in the activity of both GSH and antioxidant enzymes (SOD-CAT system) after melatonin treatment of isolated carp hepatocytes provides persuasive evidence of an important role of the glutathione system as well as SOD-CAT system as the major defense against oxidative stress during H2O2-induced oxidative damage. The cellular response to stresses is represented at the molecular level by rapid synthesis of molecular chaperones such as HSP70 and HSP90 . Through the chaperone function, HSPs are likely to protect proteins against denaturation or oxidative inactivation, or assist in the folding of stress-modified proteins . Both HSP70 and HSP90 chaperones cooperate in client protein folding to an active conformation, protein stabilization, and protein turnover by the formation of multichaperone complexes . The recruitment and regulation of Hsp90 client proteins is connected to the function of Hsp70 and a multitude of other cochaperones. HSP90 initially tries to buffer the effect of oxidative damage followed by Hsp70-dependent protective events . Similar pattern of HSP90 and HSP70 expression level in H2O2-stressed fish hepatocytes was observed in the present study. Significant reduction (P < 0.05) in HSP90 and HSP70 expression after melatonin treatment of H2O2-exposed hepatocytes indicated the protective efficacy of melatonin against oxidative stress (Fig. 2a). HSPs have the inherent ability to decrease the intracellular level of ROS by modulating metabolism of glutathione to maintain it in a reduced state . In the present study as well, melatonin treatment of H2O2-stressed fish hepatocytes restored GSH levels similar to that in control hepatocytes (Fig. 1). HSP may also act to promote survival and prevent cell death through the modulation of other important signaling pathways affected by excessive ROS accumulations as observed in the fish hepatocytes in the current study. HSP has been reported to regulate ERK1/2 in the MEK-ERK pathway . Akt interact with HSP to perform different processes in cellular signaling mechanism [27, 28, 29]. 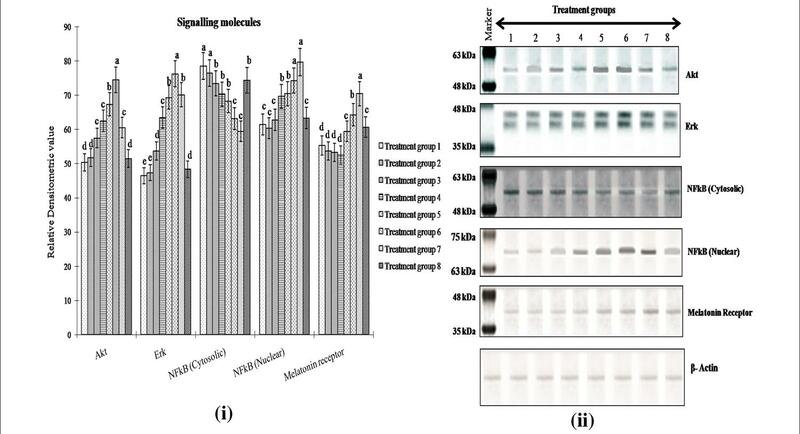 Therefore, activation of ERK1/2 and Akt expression after peroxide treatment support previous observation regarding HSP90 upregulation in the pollutant-stressed fish hepatocytes . Melatonin treatment at highest dose was quite eminent to regulate the MAPK pathway by decreasing the expression of both ERK1/2 and Akt to basal level. Earlier report suggests that Akt activation is analogous to HSP induction. Formation of Akt-HSP complex stabilizes Akt that protects the cells from undergoing apoptosis . A direct correlation between resistance to oxidative stress and activation of ERK1/2 or Akt has also been put forth earlier . Thus ERK1/2 and Akt induction in H2O2-stressed hepatocytes as compared to their control counterparts reinforce the view that ERK and PI3 K/Akt signaling pathways contribute to the survival of cells under H2O2 related stress as reported earlier [31, 32]. The NFkB family of transcription factors has a fundamental role in protecting the cells from apoptosis during exposure to a variety of stressors [33, 34]. Expression pattern of cytosolic and nuclear NFkB were analyzed to establish their influence on survival and health of H2O2-stressed hepatocytes together with signaling modulators ERK1/2, Akt in the hepatocyte. Significant activation of ERK1/2 and Akt and an enhanced nuclear NFkB expression was noted in H2O2-stressed fish hepatocytes. In these hepatocytes as compared to control counterparts, NFkB levels significantly increased in the nucleus indicating the movement of activated NFkB from cytosol following peroxide stress. Under normal condition, NFkB is present in the cytoplasm in an inactive state and translocates from cytosol to nucleus upon activation by stressor stimuli . During H2O2-related oxidative stress, enhanced activation of NFkB characterized by its translocation from cytosol to nucleus was evident which suggests the prevalence of pro-survival mechanism mediated by NFkB in stressed fish hepatocytes. Such finding was similar to those reported in hyperoxia model of oxidative stress, where significant increase in NFkB activation and translocation in the nucleus has been demonstrated . In an earlier study, altered ERK expression was noted in response to oxidative stress in fish hepatocytes . Since high dose of H2O2treatments lead to excessive ROS production, it activates the transcription factor to modulate the antioxidant system. A few earlier reports demonstrated that activation of NFkB in response to hydrogen peroxide is cell type-specific and an increase in ROS may result in NFkB activation . In certain cell types, oxidative stress is a potent activator of NFkB and other transcription factor such as MAPK which can have important consequences for cell survival and cell signalling. In our current study once ROS levels increased at higher H2O2 treatment it affects the antioxidant status specifically glutathione metabolism that causes increased lipid peroxidation (Fig. 1a). In such circumstances, HSPs act as the central mediators to regulate the NFkB activation and translocation process which in turn modulate the ERK/Akt signaling cascade. Current study provides strong support to earlier hypothesis regarding dose dependent effect of melatonin on induction of cellular signaling process under severe oxidative damage. Only the highest dose (100 µg/ml) of melatonin treatment in H2O2-stressed fish hepatocytes could reduce expression level of ERK and Akt (Fig. 3) indicating that this particular dose would be effective to ameliorate H2O2 induced oxidative stress in fish hepatocytes.